Midway through CBS’ hourlong NCAA tournament selection show, Noah Dickerson started getting a little nervous when half of the 68-team field was revealed, and the Huskies hadn’t heard their name. Finally, the drought is over, and after eight years the Huskies will dance on the biggest stage in college basketball. Washington (26-8) returns to the NCAA tournament as the No. 9 seed in the Midwest region and will play No. 8 Utah State (28-6) on Friday in Columbus, Ohio. Tipoff is 3:45 p.m. on TNT and the winner will likely face No. 1 North Carolina in the second round Sunday. UW players and coaches watched Sunday’s selection show at coach Mike Hopkins’ home during an afternoon filled with nervous anticipation and joyous celebration. “This feeling just jumped on me,” UW guard David Crisp said. “I jumped out of my seat and was screaming. It was crazy. I can’t even explain it. The Huskies gave themselves a moratorium on reveling in their journey from a 9-22 team two years ago to a Pac-12 regular-season championship squad that includes the league’s player of the year (Jaylen Nowell) and defensive player of the year (Matisse Thybulle). 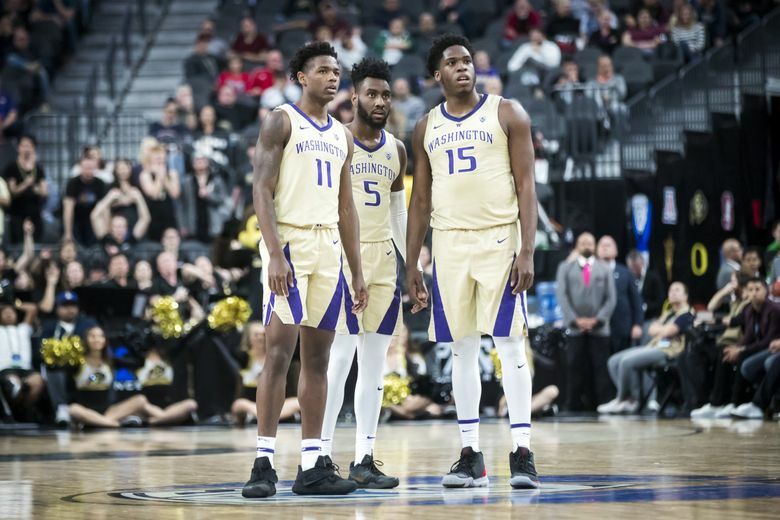 Returning to the NCAA tournament is particularly a satisfying accomplishment for UW’s four seniors, Dominic Green, Crisp, Dickerson and Thybulle. Rather than reminisce on the past four years, the Huskies are focused on the next five days and Friday’s game at Nationwide Arena. “My immediate response was, OK what now?” Thybulle said. “It’s exciting, but none of us players know what it’s like to be in the tournament. In many ways, Utah State will travel a similar path to Columbus. The Aggies also snapped an eight-year NCAA tournament drought under the guidance of first-year coach Craig Smith, who took over a team that hadn’t had a winning season in the previous three years. That’s where most obvious comparisons end between the Huskies and Aggies. Washington is a defensive team that allows just 64.3 points per game whereas Utah State is one of the highest-scoring teams in the nation, averaging 79.2 points. The Huskies are led by Nowell and its senior quartet while the Aggies rely heavily on stars Sam Merrill and Neemias Queta. Merrill, a 6-foot-5 junior guard who averages 21.2 points, 4.2 assists and 4.0 rebounds, won the Mountain West player of the year award. And Queta, a 6-11 freshman who averages 11.9 points, 8.9 rebounds and 2.4 blocks, claimed the conference’s defensive and freshman player of the year honors. Since winning 15 of 16 games at midseason, Washington has been inconsistent while compiling a 4-3 record in its past seven games, including an embarrassing 68-48 defeat to Oregon in the Pac-12 tournament final. Utah State is riding a 10-game winning streak that’s tied for eighth longest among the 345 Division I teams. The Aggies tied for first in the Mountain West regular-season race at 15-3 and captured the program’s first conference tournament title with a 64-57 win over San Diego State to punch their ticket to the Big Dance. It’s an understandable assumption considering Washington’s frightful second-half performance in its last outing when it was outscored 40-22. Hopkins said his biggest challenge this week in preparing Washington for the NCAA tournament starts with demystifying March Madness. “The bottom line is it’s all hype, and it’s excitement,” said Hopkins, who spent 22 years as a Syracuse assistant and appeared in 16 NCAA tournaments, including the 2003 national-championship team. “The key to this tournament is you got to be focused and go out and play well. You can’t get caught up in the moment; you just got to do what we do. Hopkins picked up a $25,000 bonus for guiding UW to the NCAA tournament, per his contract. He’s received $80,000 in bonuses this season, including $40,000 for UW winning the Pac-12 regular-season title and $15,000 after being named the conference’s coach of the year. Where: Nationwide Arena; Columbus, Ohio. The Dancing Dawgs are back.